What follows is documentation and photographs of the removal of the caps that cover the low speed air mixture screws on an American specification Kawasaki W650, 2000 and later. 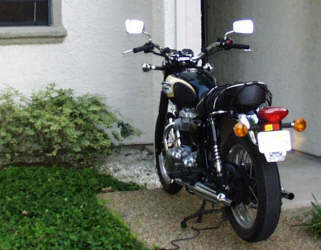 The bike used for the article is a 2001 American Specification W650A2. Some countries do not require these caps, so check your bike out before buying power tools! The intention is to give the user access to the low speed air mixture screws to eliminate the lean condition at idle thus stopping the over-run 'burbling' through the exhausts, allow the bike to idle from cold with less use of the choke and fatten up the engine's response in the 1000 to 3000 range. Use this information at your own risk. This modification may violate your warranty. Most of this is gathered from various sources from the WRiders Group especially Jon Haddock and Dennis Guggemos, cheers lads! This information is provided in the simplest, clearest way I can, with lots of pictures, because that's the way it works for me. If a picture isn't clear enough for you, click on it and you'll get a MUCH larger picture with better resolution. I strongly recommend looking over this entire document before you attempt this modification. There are things pictured here that I wish I knew about before I ran into them. One final note before we begin: This is just one method of removing these caps. Other people have used an icepick and hammer to punch through the caps. This procedure is not without its hazards and if attempted, must be done with the utmost care and patience. Proceed VERY slowly. The procedure takes no more than half an hour. Doing this yourself can save quite a bit of money over having a dealer do it. Your dealer will most likely remove the carburetor s to do the job, which can run into some heavy bread. If you rush this job, it is possible to crack the tube that houses the screws. 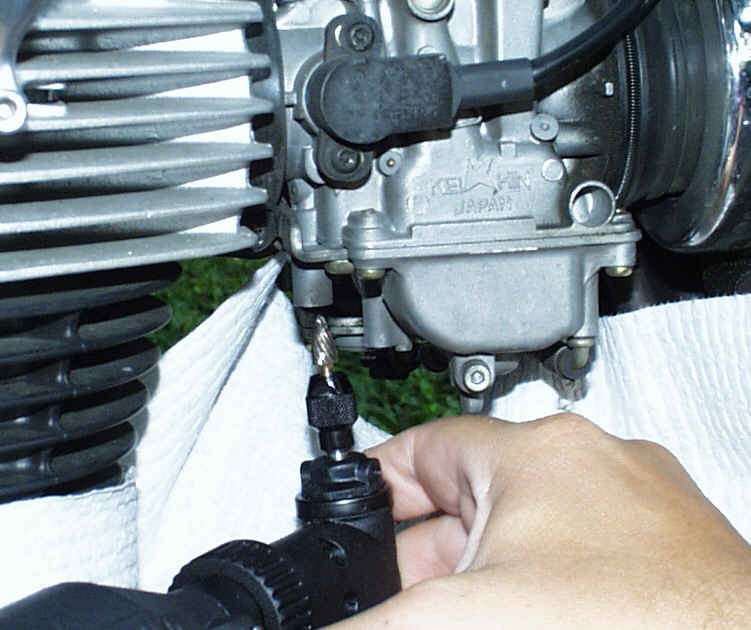 If this happens, you may need to replace the entire carburetor . I'm not trying to scare you away from this modification, I'm just hoping you'll understand the need to proceed SLOWLY and carefully. Now that you understand, let's begin. 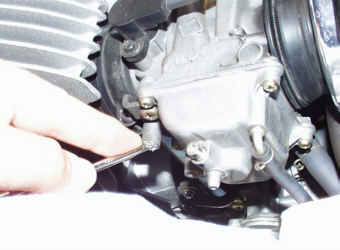 I recommend doing this when the bike is cold, as you'll be working on the motor and very close to the exhaust system. 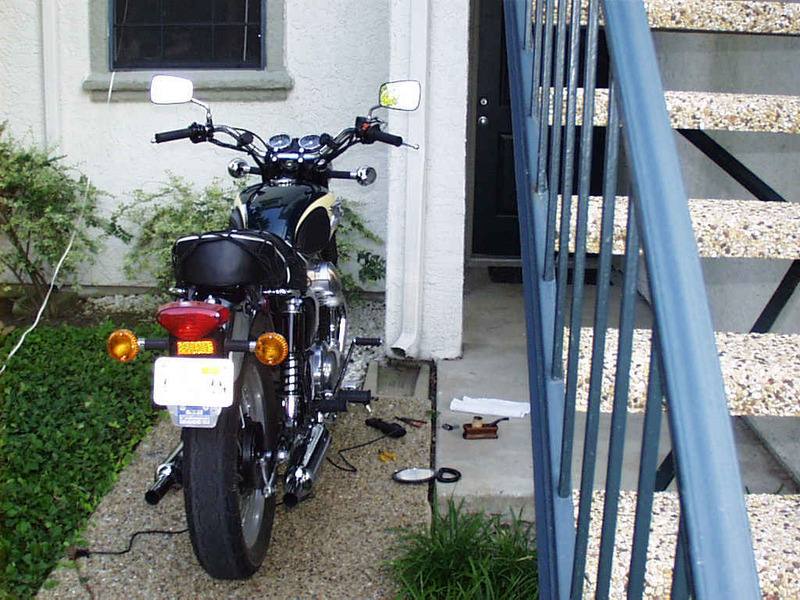 Place the bike on the centerstand because you'll be working on both sides. 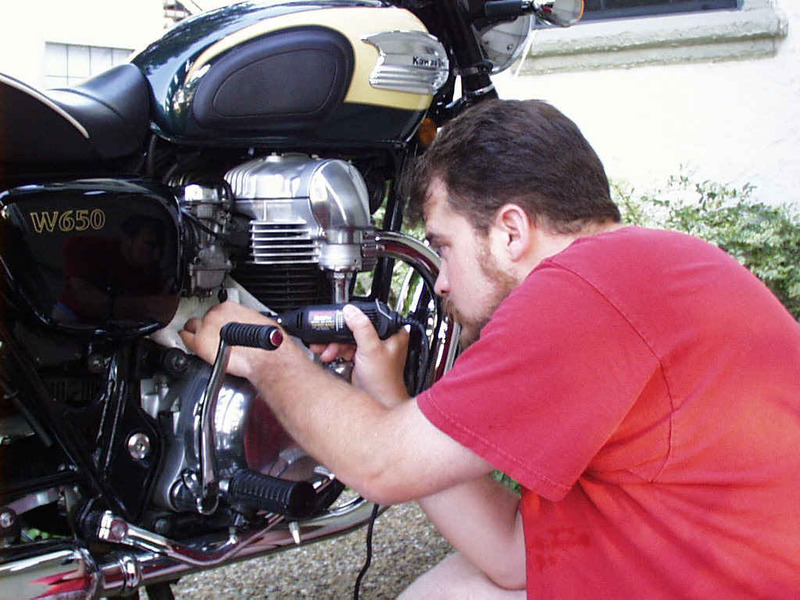 Gather your tools while the bike cools. For this operation we'll be using a Dremel Multipro, the same one used for the airbox modification. You'll need the right-angle attachment for the tool. I'm not sure what the name of this particular bit is, but it's very effective. 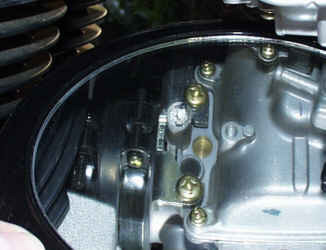 A small mirror is necessary, as well as a thin pointy tool to pry the caps out. I used an awl. 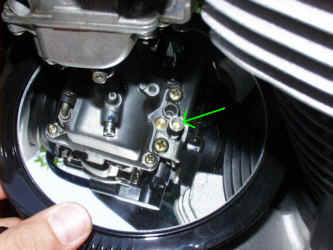 Start on the left side carburetor . 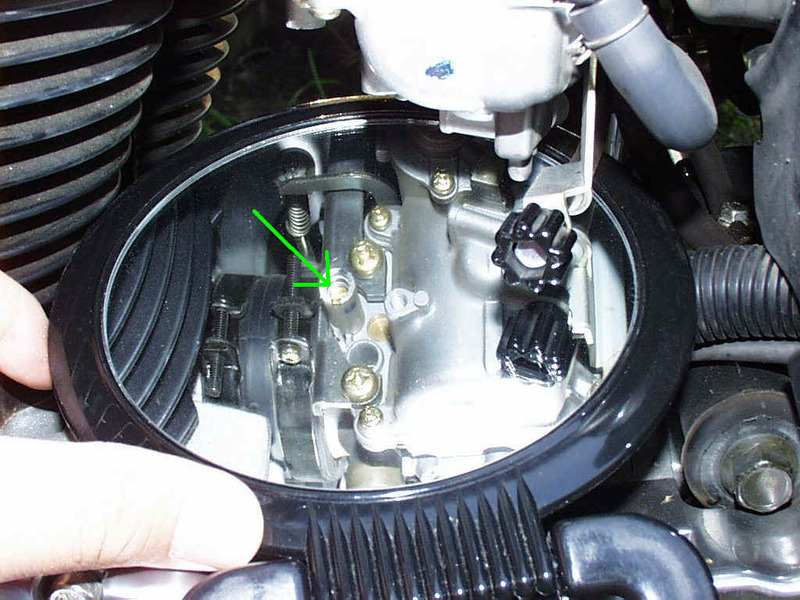 Sit next to the bike and have a look underneath the carburetor using your small mirror. Locate the tube that points straight down from the carb. It will probably have a marker swipe across it. In this picture the red arrow indicates the cap as viewed in the mirror. The green arrow indicates the actual area we'll be working in. 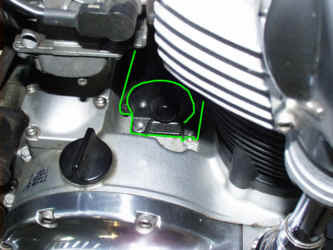 The green circle shows the idle knob, to help you get oriented. 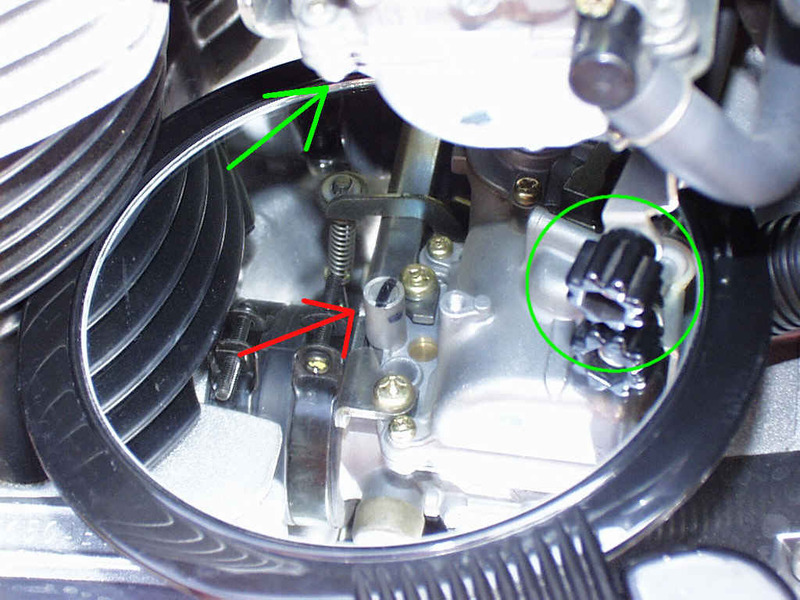 Place a paper towel underneath the carburetor , covering this part, the starter motor (outlined in green). This view is from the other side of the motorcycle, but I wanted to show you why we're putting a paper towel down. 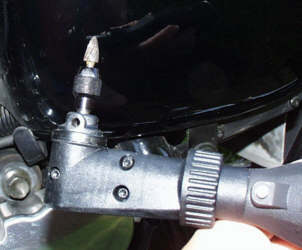 If you do not cover the starter, when you finally pry the caps out, they will fly off of your tool and be sucked magically under the starter, leading you to use language inappropriate for your local municipality. 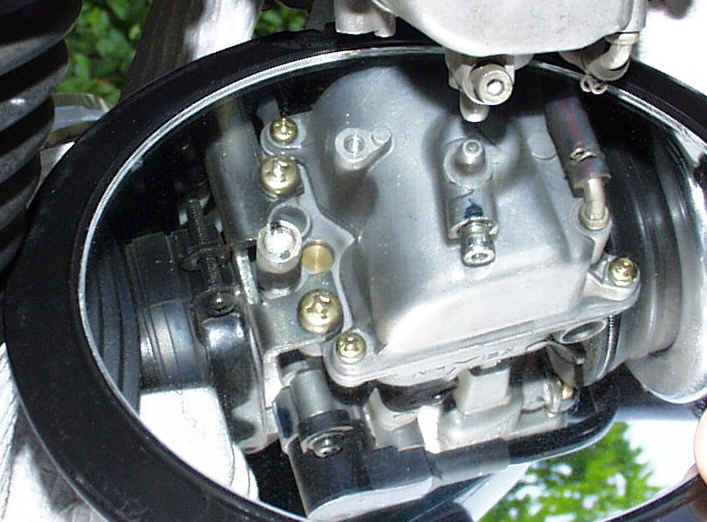 Now that the starter motor is safely covered, use your mirror once more to be sure you'll be applying the Dremel bit to the right part of the carb. Start the tool at half its top speed, at least. With infinite care, but a firm touch, apply the bit to the center of the cap. Allow the bit to do its work, do not force it or you could cause it to walk across the surface of the cap. Just let it dig in to the center. If it starts to move, back off and bring it back to center and begin again. Take your time here, or you'll just make it a long tedious process, like this paragraph. 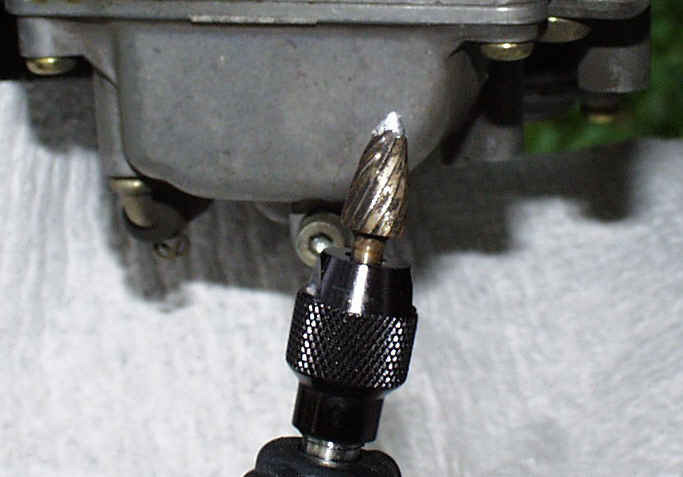 Stop when you've penetrated about a half-millimeter into the cap, stop the Dremel and check the top of your bit. You may find it clogged with cap material. Remove this material with a paper towel, it may be very hot. While you've stopped, get out your mirror and check your progress. 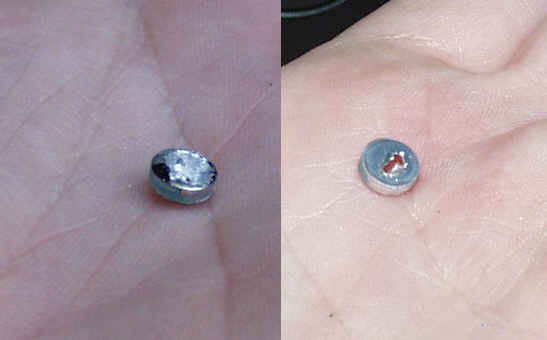 If you still see just silver, you'll need to continue SLOWLY boring into the cap. Reapply the Dremel to the cap, and proceed about another half-millimeter. Stop the tool and check again with the mirror. If you can see a hole, you should be through boring, unlike me. Insert your awl or similar Very Pointy Tool into the hole you've created in the cap and very gently pry the cap out. If it doesn't move immediately, try again, move your awl slightly, wiggle it a bit, take your time. It doesn't take much force to dislodge the cap, and you must take great care that you do not damage the tube that the caps are press-fitted into. 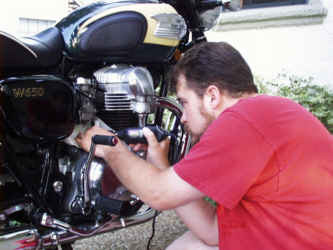 If you destroy the tube, you may have to replace the whole carburetor , a situation that old-time motorcycle mechanics refer to as "sucking". 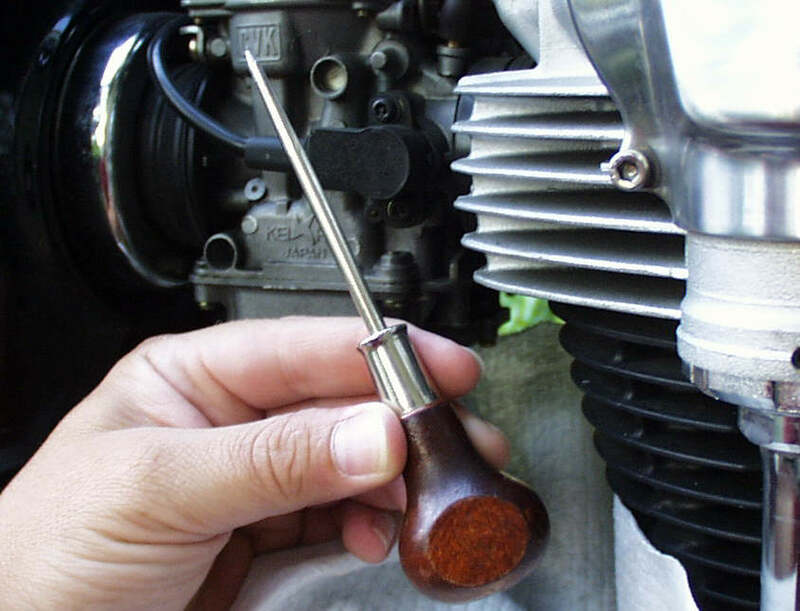 If you are the type of person that usually enjoys good luck with mechanical things, the cap will remain on the awl when you remove it. Here's a closer look at the cap now that it's removed. Notice the thickness of the cap. Now you know how much material you're drilling through. Use your mirror again and have a look at your handiwork. You should see the brass-looking screw residing up inside the tube. 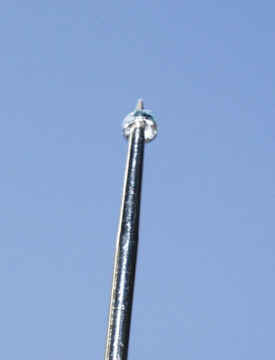 Notice here how far up inside the screw is. This is why you don't want to apply a lot of force with the Dremel. You don't want to bugger up the head of the screw. That would make you very sad. Now move to the other side of the bike and place your paper towel over the starter. Move the kickstarter out of the way, and repeat the process. It's exactly the same for this side as the other. Please note that the person in this photograph is using an unplugged tool solely for demonstration purposes. When using a Dremel, proper eye protection is a must, because there is a possibility of hot flying metal shards. Take a close look at this picture. This shows just why the paper towel is important. When this cap was pried out of its hole, it did fall off the awl and it did indeed try to reach the bottom of the starter. The paper towel allowed for a quick retrieval. Use your mirror and verify that the cap is totally out and that the screw head is undamaged. You can now adjust the low speed air mixture screws to your liking. 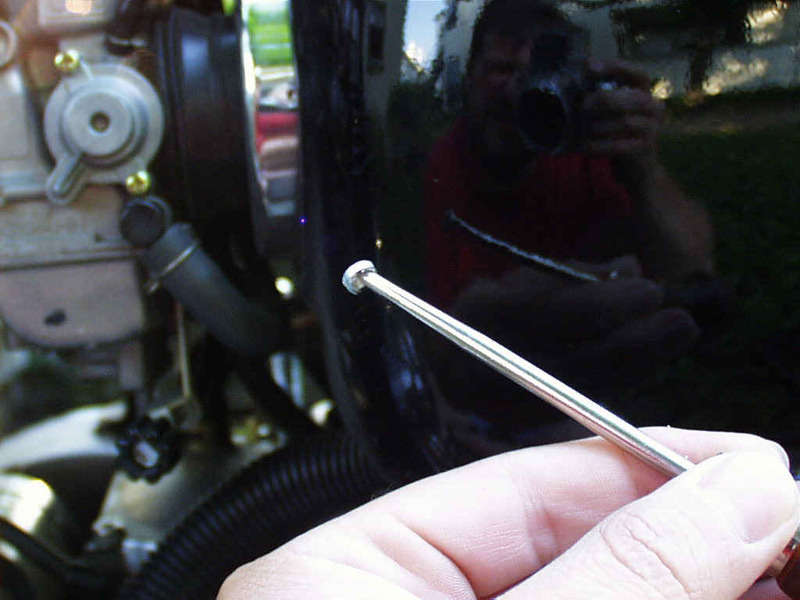 Here's a short treatise describing the proper way to adjust these fuel screws. Many people on the list have reported good running by putting the screws at three to three and a half turns out, but that's just a place to start. Run the screws in, counting exactly how far it takes to stop (so you can return them to factory settings if you are not happy with your modification). Then turn them out the desired amount. 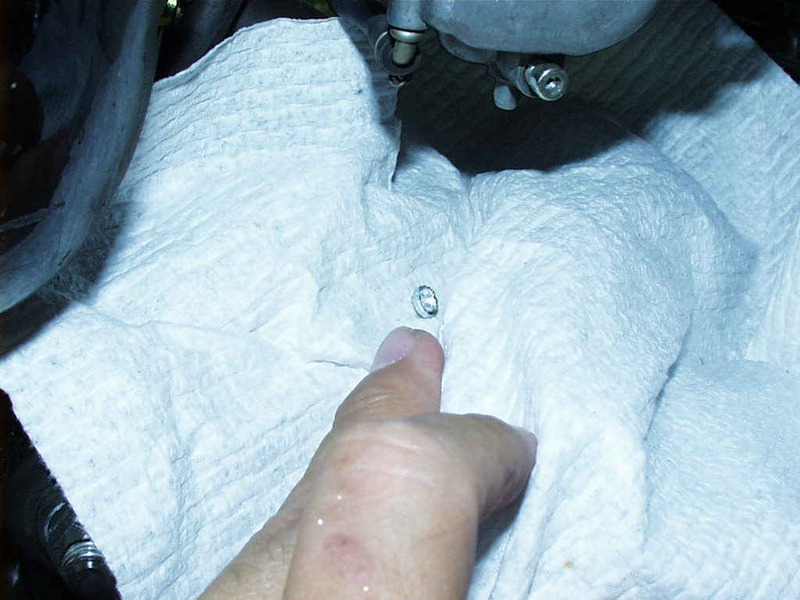 IMPORTANT: When you run the screws in, turn them in gently and slowly so they just touch bottom. Bottoming them out with excessive force is very bad. For those of you new to this sort of thing, don't assume that you need a fancy workshop or garage. This procedure was carried out on the sidewalk leading to an apartment, with the power cord for the Dremel run out of the window. You simply need a good flat stable surface, good light, and power for the tool.